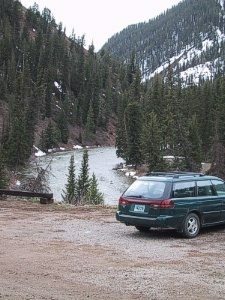 Our on site housing in situated on a hillside halfway up our driveway, overlooking the confluence of Granite Creek and the Hoback River. 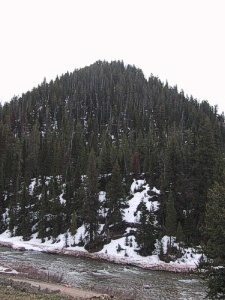 The kennel is surrounded by the Bridger – Teton National Forest, to the east of Highway 191 & 189. Our closest neighbors are in Bondurant 7 miles to the south, or seven miles to the north near Willow Creek and Camp Creek. 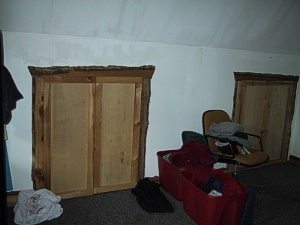 The building was completed in November of 2000 and is a two story Four-Plex with rough – cut cedar siding with a barn shaped roofline. 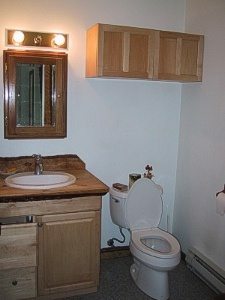 Each apartment has an upstairs and a downstairs and its own water heater, electric meter and phone line. 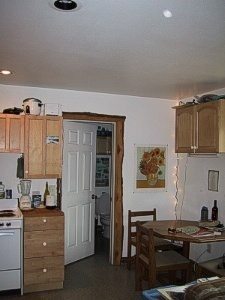 Downstairs, with linoleum flooring, is the living room, kitchen complete with (refridgerator and stove/oven, microwave oven) and bathroom with shower. 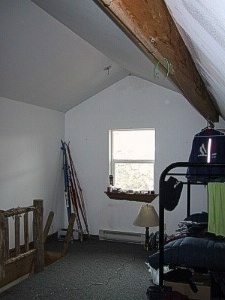 Upstairs, with wall – to – wall carpet, is one large bunkroom with 2 closets. All apartments are partially furnished. All trim inside is rough cut to match the exterior siding, along with the log style ladder to reach the upstairs/loft area. 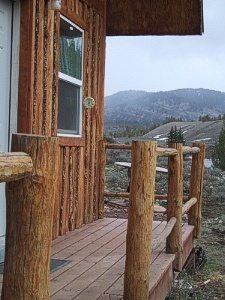 All apartment entries have decks surrounded by log railings. 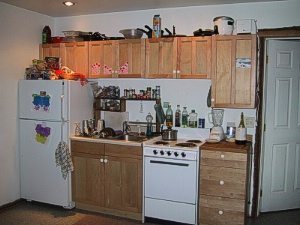 Each apartment is shared by two or three persons. Tenants are responsible to share electric and phone bills and have those utilities changed into the tenants’ names upon arrival. Well water is provided with the apartment. Four Wheel drive is required to get up the driveway in the winter. Below driveway parking is available in the winter. During the summer when the rent is exchanged with dog chores, it is important to understand that even though there is no money exchanged and tenants have other paying jobs, this job should rank as number one, most important because your housing depends on it. If you miss your chores, then you have no place to live. Each apartment rent is equivalent to $600.00 per month and chore wages are equal to $10.00 per hour. Each apartment tenants must complete a total of 60 hours per month, which is about 15 hours/week. So if there are 2 people in an apartment, they each must complete 30 hours per month or about 7 hours/week, approximately 3-4 mornings per week. You must be in above average physical shape for this job, summer or winter. Duties include lifting 50 lbs bags of dog food, 5 gallon buckets of water, dog food and dog poop. Handling of large, strong dogs is occasionally required. There is no such thing as calling in sick on this job since there are animals relying on you to take care of them. Very strong work ethics are required such as reliable, responsible, resourceful, honest, courteous, considerate, motivated, dependable, good communicator and team player. Mornings: between 5:00AM and 10:30AM. Each morning’s chores should take between 1 and ½ to 2 hours per person with 3 workers per day. All tenants shall sign lease agreement (7 months for summer, 5 months for winter) and pay 1 month security/cleaning deposit upon arrival along with first month rent, 1 month extra deposit for each pet. Pet negotiation must be pre – arranged before arrival. Summer rent/chore exchange workers will be placed first on the list of applicants for winter guiding positions available for the upcoming winter season, which runs from November 15 – April 15. Applicant does not need previous sled dog experience, although any type of guiding experience or employment in the customer service industry is helpful. Animal experience of all types is also helpful. Any experience with hard physical labor with extended work hours is appreciated. Must be a team player and have good communication skills. aside from their own assigned 20 dogs. Guides will be taught “Sled Dog 101” which includes health, psychology, conditioning, training, sled driving and client management tips. Teton Science School Graduate students teach a one day winter guide training course which includes natural history, ecology, flora, fauna and geology of the area. A copy of the JHI training manual will be given to each employee upon arrival which includes tips on all the above mentioned items along with the Teton Science School agenda and other suggested reading lists. Arrive at kennel between 7:00AM and 7:30 AM. Complete various rotating assigned group chores inside kennel such as washing floor, cleaning bathroom, emptying garbage, shovel sidewalk, etc. Start guiding tour, either full day trip, (20 miles/ 4 hours sled time) to half – day trip (12 miles/ 2 hours sled time) All trips include lunch service for clients and guides. Return from tour ,water, un – harness and un -hook dogs. Re-organize and put away gear. Complete final preparation and mixing of dog food. Routine maintenance on equipment, replacing chain or snaps on dog houses, tightening bolts or lash string on sleds, washing sled bags. Routine maintenance on dogs, clipping toenails, checking general health and condition of dogs, record keeping on dog mileage and health charts. Routine snow shoveling around dog houses and side hill trails. Day completed by 2:00PM to 5:00PM variable depending upon scheduling of half day or full day trips. Rotation of night feeding: (once per week rotation between guides) return to kennel between 8:00 PM and 9:00 PM for second feeding. This requirement is seen in the every day chores since the guide is outside in the elements and on their feet almost all day. Lifting 50lb bags of dog food or blocks of meat and handling 50 pound dogs from their dog houses to the sled will put you in tip shape faster than working out at the fitness center. Daily jogging along side the sled while on a tour will increase your lung capacity while acclimating your body to the elevation of 6500’ at the kennel to just under 7000’ at the end of the trail. Chopping meat with an axe will work the upper body. The most challenging physical aspect of the job is shoveling snow. Shoveling out dog houses requires moving the wooden spool dog houses, shoveling a pedestal of snow and moving the dog house onto the pedestal of snow and filling in snow under the house. Depending on how many snowstorms arrive, you can expect to shovel snow to move 20 houses in your own yard along with many houses in neighboring yards, about 2 – 3 times in a season. A strong back is required for this task along with a lot of teamwork, as most of these spool houses cannot be moved by one person. Winter clothing/ layers including waterproof/windproof jacket with liner. When guides arrive they will be required to sign a lease through April 15 and pay a one month security deposit of $200 per person. Rent is exchanged for training from mid November through the end of December. First month rent is due Jan 1. and the first day of each month thereafter. Rent is payable by check or cash at the tour office. Guides are responsible for changing the utilities (electric and telephone) in each apartment into their names when they arrive and when they leave. Cell phones do not get reception at the kennel due to numerous mountain ranges. Water is included with the apartment. Starting salary at $1,500.00 per month paid bi- monthly on the 1st and 16th of each month. First Salary paycheck is on Jan 1st. First salary pay period runs from December 16 through Dec 31. If a guide takes a tour before Dec 16, they will be paid $50 per trip. Any gratuities paid by credit card will be added to next paycheck and taxes will be deducted. Work schedule is 6 days/week approximately 7-10 hours/day. No sick time or time off is allowed for this 5 month commitment. During the holiday season from December 20 – Jan 5 everyone works 7 days/week.